As I approach my 30th year on this planet, I wanted to add a therapeutic post sharing my experiences over the last year adopting a paleo/primal lifestyle. This officially marks a major milestone in my understanding of personal health and wellbeing. To all the individuals I am nutritionally coaching at the moment: this is what you can expect if you stick to the high-fat, low-carb protocol. Exactly one year ago I took a headfirst dive into the sordid world of optimal human nutrition and, to a lesser extent, fitness. I tried to approach my experimentation without prior bias and applied the scientific principles I’ve valued as a career engineer: do enough research to form a hypothesis and test, test, test, test… then test again. Eating fat doesn’t make you fat. I ate 80% of my calories from fat and lost body fat while gaining/maintaining muscle mass. Counting calories is an inefficient model for guiding body recomposition. I ate as much as I wanted, whenever I wanted. Fitness is non-essential for weight loss efforts, but can be a great accelerator for those efforts. I worked out on average for 30-45 minutes per week. I exclusively did dead lifts, bench press, and squats with dumbbells. Kettlebell swings too. No cardio, no ab work. There is no such thing as an "essential carbohydrate." Your body can produce glucose on its own, we don't need dietary carbs to supplement serum glucose. I advocate eating some non-grain carbs of course, but left unchecked they will increase body fat and make you insulin resistant. Does this mean that I think individuals shouldn’t exercise? No, of course not. Does this mean that weight loss success can’t be realized if an individual chooses to count calories? Nope, many folks do have success following that model of energy balance. Does this mean everyone should be on a high-fat diet? Probably not, though I think most folks would do well if they experimented with ketogenic protocols. You'll notice I didn't magically transform into some shredded 7% body fat maniac in one year's time. These are typical, average results that anyone can expect if they take a similar approach to my own. 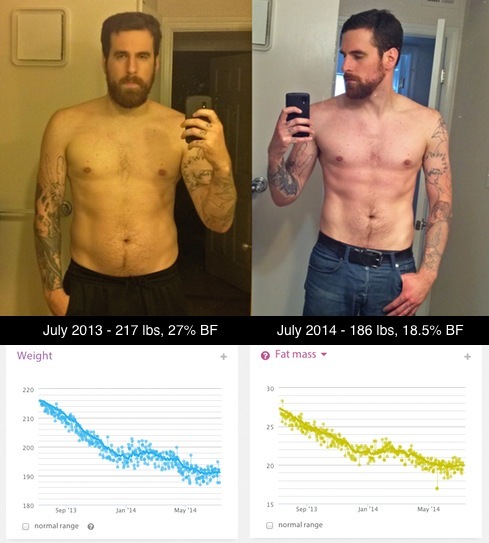 I took a moderate path to nutrition and fitness informed by actual testable science (eschewing everything the government and mass media tells us to do in order to improve your health), which yielded consistent, sustainable results over a significant period of time. The real lesson I've espoused here? Compliance guided by informed research is the key to sustained success. Anyone can do and even surpass what I've done in the last year. Whether you're a passionate biohacker or not, this lifestyle can be for everyone. It may not always be easy — but it's always simple.